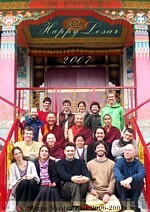 In 2006 the first Rigpa Shedra East took place at the Palyul Retreat Centre in Kathmandu, Nepal. Students spent four months studying Mipham Rinpoche’s Khenjuk with Khenpo Pasang Tenzin. 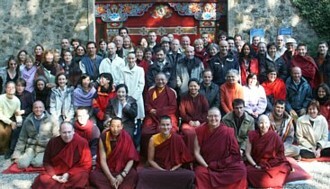 In 2007, the Shedra East focused on Shantideva’s classic text, the Bodhicharyavatara. MP3 audio files of these teachings are available here. In 2008, Shedra East students studied Shantarakshita‘s Ornament of the Middle Way (Skt. Madhyamālaṃkāra; Tib. Uma Gyen). In 2009, the Shedra East focused on the Uttaratantra Shastra (Tib. Gyu Lama), Buddha Maitreya’s famous treatise on buddha nature, following Mipham Rinpoche’s commentary. In addition, Khenpo Namdrol taught on Mipham Rinpoche’s original treatise entitled ‘Lion’s Roar, an Exposition of Buddha Nature‘. At Sogyal Rinpoche’s request, at the end of the 2009 Shedra East courses, students devoted an entire month to strict personal retreat. The main text studied at Shedra East in 2010 was Madhyamakavatara (Tib. Umajukpa) and its auto-commentary by Chandrakirti. For the second year, Dzigar Kongtrul Rinpoche gave a commentary on Maitreya’s Uttaratantra Shastra, Ringu Tulku taught Mipham Rinpoche’s Wheel of Investigative Meditation and Professor Steven Goodman introduced the basic themes of the Abhidharma. For the second part, we had the good fortune to study Haribhadra’s Clear Meaning commentary on the Abhisamayalankara with the young and brilliant Khenpo Jampal Dorje from Dzongsar Monastery in India. During his lively and extremely detailed presentation, he drew upon the writings of the great Sakyapa master Kunkhyen Gorampa and especially upon the annotation commentary of the great Khenpo Shenga, to whose lineage he himself belongs. From May 14 to May 16 2010, Ringu Tulku Rinpoche taught in Lerab Ling on An Instruction on the View of the Mahayana Clarifying the Two Truths, a short text on the two truths by Patrul Rinpoche. From May 25 till June 5 2010, Khenpo Pema Sherab taught the first of a series of teachings on Mipham Rinpoche‘s Beacon of Precious Certainty concluding Lerab Ling‘s 2010 Shedra West programme.